There's a lot more to the Vans Warped Tour than a parking lot full of tour busses, condom tents and a few headlining acts playing songs you heard last season on "The Hills." The backbone of Warped consists of all those hardworking and under appreciated bands that grind it out everyday in the sweltering summer heat. Last week, at the Hartford stop of Warped, I had the chance to meet Jake Langley of the Pennsylvania pop-punk band, Handguns. It was a chance encounter. He stopped me because he liked my shirt. We started talking music, and he let me listen to his band. Having no cash, I couldn't buy a copy. 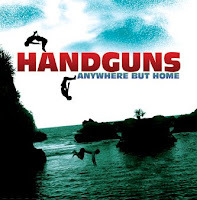 But Jake let it slide and gave me Handguns' EP, Anywhere But Home, free of charge... under the condition that I actually listen to it. Well, the whole ride back to Boston was filled with what I found to be an amazing and fresh sounding slice of pop-punk. The key, as I've found, to Handguns is that they actually play punk music. Yes, it's pop, but it's still punk. Thank God. Anywhere opens with the quick 1:23 song "My Own Captain" which could stand as the anthem for every do-it-yourself punk band out there today. The seven song EP only picks up speed from there. "Harbor Water" is probably the catchiest of the lot. Plenty of crunchy guitar riffs, a steady bass line and a few gang vocals for good measure will have you singing, "Woah-oh-oh-oh!" over and over again. The title track rounds out the EP nicely. Jumping on board with many of their contemporaries, "Anywhere But Home" is all about leaving that dead-end job for a life on the road. "I'd rather play three chords for three kids/than spend one more day there/complaining about my dead-end job not getting me anywhere"
But seriously, if you're a fan of bands like Four Year Strong, The Wonder Years, Man Overboard, ext, then you'll love Handguns. Help these guys out! They're following the Warped Tour all summer (not playing it, following it) just to sell CDs and meet fans. Plus they're really nice, and the EP comes with a sticker reminding you not to grow up. What more could you ask for?